off against each other. 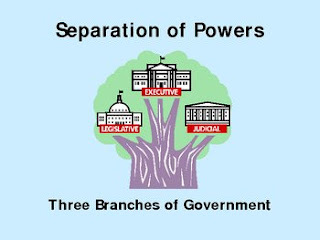 The principle of separation of powers deals with the mutual relations among the three organs of the government, namely legislature, executive and judiciary. This doctrine tries to bring exclusiveness in the functioning of the three organs and hence a strict demarcation of power is the aim sought to be achieved by this principle. This doctrine signifies the fact that one person or body of persons should not exercise all the three powers of the government. Montesquieu, a French scholar, found that concentration of power in one person or a group of persons results in tyranny. And therefore for decentralization of power to check arbitrariness, he felt the need for vesting the governmental power in three different organs, the legislature, the executives, and the judiciary. The principle implies that each organ should be independent of the other and that no organ should perform functions that belong to the other. The government should be that of a government of law and not of men. The premise behind the Separation of Powers is that when a single person or group has a large amount of power, they can become dangerous to citizens. The Separation of Power is a method of removing the amount of power in any group's hands, making it more difficult to abuse. There are three main organs of the Government in State i.e. legislature, executive and judiciary. According to the theory of separation of powers, these three powers and functions of the Government must, in a free democracy, always be kept separate and exercised by separate organs of the Government. Thus, the legislature cannot exercise executive or judicial power; the executive cannot exercise legislative or judicial power of the Government. 1. That the same persons should not form part of more than one of the three organs of Government. 2. That one organ of the Government should not control or interfere with the exercise of its function by another organ, e.g. the Judiciary should be independent of the Executive. 3. That one organ of the Government should not exercise the functions of another. The Indian Constitution has indeed not recognized the doctrine of separation of powers in its absolute rigidity, but the functions of different parts or branches of the government have been sufficiently differentiated and consequently it can very well be said that our Constitution does not contemplate assumption, by one organ or part of the state, of functions that essentially belong to another. In India, we follow a separation of functions and not of powers. And hence, we don‘t abide by the principle in its rigidity. An example of it can be seen in the exercise of functions by the Cabinet ministers, who exercise both legislative and executive functions. Art.74 (1) wins them an upper hand over the executive by making their aid and advice mandatory for the formal head. The executive, thus, is derived from the legislature and is dependent on it, for its legitimacy, this was the observation made by the Hon‘ble Supreme Court in Ram Jawaya v. State of Punjab (1955 SC). On the question that where the amending power of the Parliament does lies and whether Art.368 confers and unlimited amending power on Parliament, the Supreme Court in Keshavanand Bharti v. State of Kerala (1973 SC) held that amending power was now subject to the basic features of the constitution. And hence, any amendment tapering these essential features will be struck down as unconstitutional. Beg. J. added that separation of powers is a part of the basic structure of constitution. None of the three separate organs of the republic can take over the functions assigned to the other. This scheme cannot be changed even by resorting to Art.368 of the constitution. There are attempts made to dilute the principle, to the level of usurpation of judicial power by the legislature. In Indira Nehru Gandhi v. Raj Narain (1975 SC), where the dispute regarding PM election was pending before the Supreme Court, it was held that adjudication of a specific dispute is a judicial function which parliament, even under constitutional amending power, cannot exercise. So, the main ground on which the amendment was held ultravires was that when the constituent body declared that the election of PM won‘t be void, it discharged a judicial function which according to the principle of separation it shouldn‘t have done. The place of this doctrine in Indian context was made a bit clearer after this judgment.